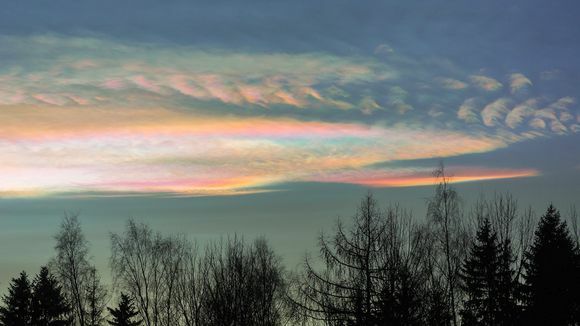 People in Western Finland reported seeing unusual multicoloured clouds around Christmastime. Polar stratospheric clouds only occur in cold enough conditions. Finland's skies have been full of stunning physics moments this year, from aurora borealis to skypunches and meteors burning up in the atmosphere. It looks chilly indeed over there. Is it really windy? Sun is shining..but then again that's when we get the deep cold the most altho that can vary too. You would think it would warm thangs up..but no. We have snow on the way overnight. It's about -6C right now and that's as cold as it's gonna get over the next five days. Rotate the pic counter clockwise , and the cloud looks like the Ancient Gawd ,,,, " Geb "
um ,, That's a Beautiful Sky Octo . SWEET ! We got about 5 inches of snow overnight and another half inch just during our dog walk a while ago. It's really pretty, I've got pics. I'll upload those later. Have mercy, that's brutal. Stay warm NM. It's pretty grim over there. I hope you plan on staying indoors.